We’ve done this before! Both Teresa and Corinne have extensive experience teaching adult beginners and coaching adult musicians who want to further their existing skills. We’re not scary. Learning a new skill as an adult can be intimidating! That’s why we place a priority on being kind and encouraging — we want piano lessons to be the highlight of your week, not something you dread. We’ll give you a discount! If you enroll in weekly lessons and are available before 3:30 p.m., you can take $20 off the price of monthly tuition! We offer flexible scheduling. If you prefer not to be locked into a weekly commitment, we offer the option to purchase a package of 4 lessons which can be scheduled as needed. Many of our adult students choose this option, and plan lessons 2-3 weeks apart. We customize curriculum to fit your goals. Do you want to be a better sightreader? Learn to improvise your own arrangements of familiar tunes? Master that one piece you’ve always dreamed of playing? We’ll come up with a plan to help you meet your goals! No cookie cutter lessons here. 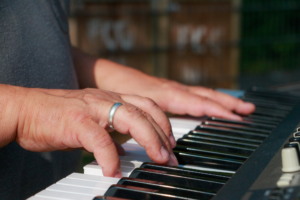 Would you like more information about adult piano lessons? Fill out our contact form below, and we’ll give you a call!